With chants like “Rain or shine, all the time, we got 350 on our minds!” and “What do we want? 350! When do we want it? NOW!” most likely anyone near 16th Street NW on Saturday heard the cries of hundreds of climate activists marching south toward the White House. The torrential rain was only a petty distraction for most marchers, soggy shoes being a small price to pay for the chance to help show President Obama and the rest of the world the importance of saving the planet from catastrophic climate change. The event, a part of 350.org’s International Day of Climate Action, was organized by the Chesapeake Climate Action Network and Hip Hop Caucus. At 3 p.m. banner-toting attendees marched from the top of Meridian Hill Park in D.C. straight to Lafayette Park directly in front of the White House, where a large rally and more chanting followed. But this only constituted the second half of the event. From 12pm-3pm many local artists and speakers graced the zero-impact stage placed atop Meridian Hill Park with insightful jams about the state of our planet and powerful speeches aimed to motivate people into action. Among the speakers and artists were the Reverend Lennox Yearwood of Hip Hop Caucus, the Young Women’s Drumming Empowerment Project, Mike Tidwell of the Chesapeake Climate Action Network, and 1Sky’s own Liz Butler. Attendees ranged from youth climate activists to families to anyone else curious about the growing climate change movement. Various environmental organizations and progressive groups set up tables with informational pamphlets and friendly faces to chat with. Many photographers and videographers roamed the rally, equally eager to capture the spirit and excitement of the day as the attendees, speakers, and performers were to provide it. Check out this YouTube video one attendee posted. Standing in the pouring rain with fellow 1Sky staffers and climate enthusiasts while casually (or with complete reckless abandonment) dancing to the tunes was the perfect fuel for the passionate march that followed. Saturday’s event was an incredibly important part of the 5,000+ global events that echoed the need for a binding international climate treaty across the world. 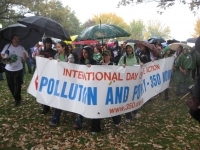 Check out pictures of many of Saturday’s events at 350.org.